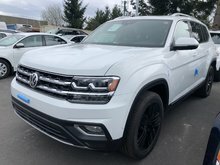 Home > New Vehicles > Volkswagen > Atlas > 2019 > 2019 Volkswagen Atlas Execline V6 4Motion w/ Alloy Wheel Pkg. 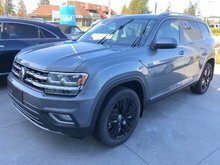 2019 Volkswagen Atlas Execline V6 4Motion w/ Alloy Wheel Pkg. Parked perfectly at the intersection of size and style, is our largest vehicle to date: meet the Atlas. 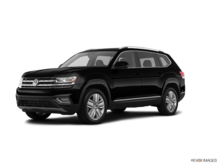 Featuring an adult-sized third row, 7 seats, your choice of either a thrilling 2.0 TSI 4-cylinder engine or an exhilarating 3.6L VR6 engine, and a suite of exceptional premium features, the Atlas satisfies your taste for the luxurious while remaining versatile enough to more-than-meet your family’s needs. So hitch up your fishing boat, pack your bags, and get ready for upsized adventures in an upsized family car – at a price that may just surprise you. Key Features: 3.6L VR6, 8-speed automatic transmission with Tiptronic® 4MOTION, 20” Mejorada Black Alloy Wheels, Volkswagen Digital Cockpit (instrument cluster), Ambient interior lighting, Area View 360?, Lane Assist, LED tail lights, Light Asist, Park Assist, Panoramic power sunroof, App-Connect smartphone integration, Fender® Premium Audio System – 12 speakers and subwoofer, Discover Media – 8.0'' touchscreen radio with proximity sensor, WLAN, CD player, satellite navigation and 2 SD card slots, HomeLink electric garage door opener, Power outlets (1) 115V USB Input (x4), Power tailgate with Easy Open function, Start/Stop technology, Power auto-folding and adjustable, heated, exterior mirrors with memory and reverse tilt-down function, Leather seating surfaces, Ventilated front seats, Heated front seats, Heated rear seats, Climatronic 3-zone electronic climate control, Leather-wrapped multifunction heated steering wheel, Rear view Camera, Rain sensing wipers, Adaptive cruise control with Stop & Go, Blind Spot Detection with Rear Traffic Alert, Second-row sunshades, KESSY – keyless access with push-start button, Remote start, LED headlights with low/high beam and signature Daytime Running Lights, Front Assist – Autonomous Emergency Braking with Pedestrian Monitoring, Driving profile selection with 4MOTION Active Control. QUESTIONS? 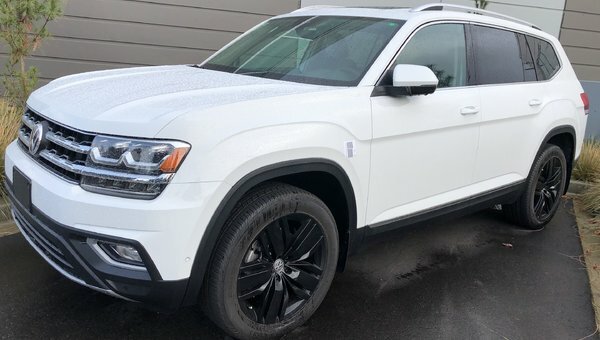 TEXT 778-949-9028 to hear about more of the features on this 2019 Atlas. 3.6L V6 276HP - V6 cyl. 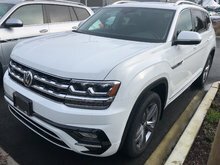 2019 Volkswagen Atlas Execline V6 4Motion w/ R-Line Pkg.